Vancouver, B.Câ€� Corvus Gold Inc. (“Corvus” or the “Company”) - (TSX: KOR, OTCQX: CORVF) announces additional drill results from its 2014 exploration program at the North Bullfrog Project, Nevada. Two separate veins were intersected within hole NB-14-380. 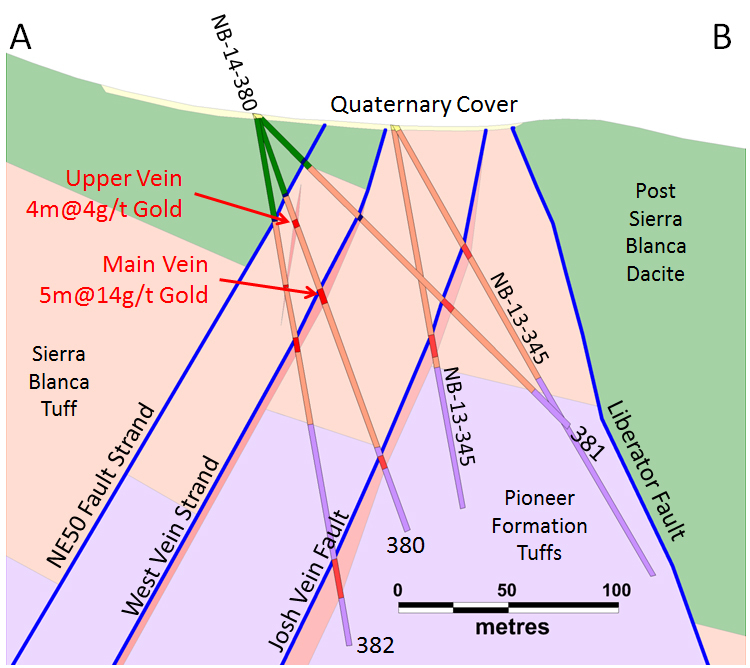 Results of the two veins were prioritized, yielding intercepts of 4.2 g/t gold and 150 g/t silver over 3.6 metres in the upper vein and 13.8 g/t gold and 243 g/t silver over 4.8 metres in the main vein (Table 1, Figures 1 & 2). This hole is situated 50 metres south of NB-14-378 (NR-14-08, March 3, 2014) and demonstrates the continuity of the newly identified West Vein located 50 metres to the west of the high-grade gold-silver Yellowjacket Deposit. Figure 1: Location of 2014 drilling at Yellowjacket. Red collar and trace indicate NB-14-380. Blue collars and traces are holes with assays pending. Blue dashed line is surface projection of Josh vein drilled in 2013. Red dashed line is projection of the new West Vein results from NB-14-380. A-B marks the location of Figure 2. Assays are pending for the remainder of NB-14-380, which includes mineralized surrounding stockwork veining similar to the Josh Vein to the east. This represents an important addition to the vein system at Yellowjacket and illustrates the new discovery potential for additional high-grade veins even in the immediate Yellowjacket Deposit area. The Yellowjacket Zone has been defined by the Liberator Fault on the east and the Josh Vein Fault on the west (Figure 2). Geological evaluation of Yellowjacket Zone after the close of the 2013 drill program indicated that the fault displacement mapped along the central part of the Josh Vein structure was not enough to account for the full stratigraphic offset indicated by other drilling to the west. On this basis it was postulated that another strand of the fault should exist west of the known Josh Vein structure. Holes NB-14-377 (assays pending) and NB-14-378 (9.2m @ 17.9 g/t gold and 260 g/t silver) and NB-13-279 confirmed the existence of the missing structure and now hole NB-14-380 has demonstrated the continuity for 100 metres along strike. As shown in Figure 2 there is also clear evidence for a third fault to the west of the West vein structure. This fault, known as the NE50 Fault from surface geology, has a north-easterly strike which is one of the important mineralized vein orientations (Figure 1). The fact that a second vein is developed between these two faults in NB-14-380 could indicate that the NE-trending fault will also be mineralized if the structure is developed in the correct host rock. The silver to gold ratio of the West Vein system is much higher than normal for the Josh Vein farther north and is more similar to the discovery hole NB-12-138 (4.3m @ 20.0 g/t gold & 1,519 g/t silver). As discussed previously (NR-14-08, March 3, 2014) the vein structure consistently pinches out as it approaches the surface and this is the case with NB-14-381 (Figure 2). However, the vein does continue to depth and was encountered in NB-14-382 (assays pending). This means that all potentially mineralized structures have to be tested at depth because the lack of mineralization near the surface is not a conclusive test of their potential. Figure 2: Cross section through NB-14-380 showing location of West Vein relative to the vein drilled in 2013. 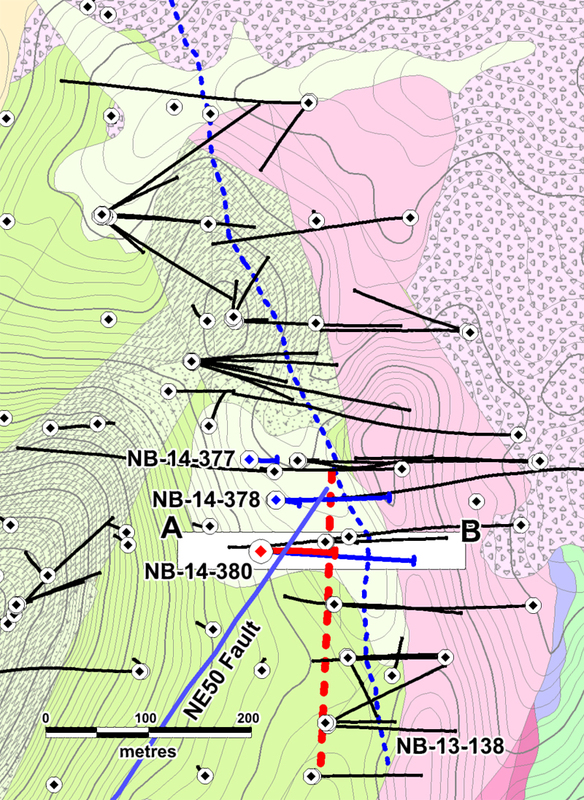 The fault to the west of the West Vein represents a potential target for future exploration. Corvus controls 100% of its North Bullfrog Project, which covers approximately 68 kmÂ� in southern Nevada just north of the historic Bullfrog gold mine formerly operated by Barrick Gold Corp. The property package is made up of a number of private mineral leases of patented federal mining claims and 758 federal unpatented mining claims. The project has excellent infrastructure, being adjacent to a major highway and power corridor. The project currently includes numerous prospective gold targets with the newly discovered Yellowjacket vein related deposit being the highest grade with an indicated resource at a 0.3 g/t gold cut-off of 4 Mt at an average grade of 0.97 g/t gold and 5.15 g/t silver for 125,000 ounces of gold and 662,000 ounces of silver and an inferred resource of 35.6 Mt with an average grade of 0.7 g/t gold and 3.86 g/t silver for 800,000 ounces of gold and 4.4M ounces of silver. At a cutoff grade of 1 g/t gold the Yellowjacket deposit contains an indicated resource of 0.9 Mt at 2.8 g/t gold and 16.5 g/t silver for 79,000 ounces of gold and 468,000 ounces of silver and an inferred resource of 4.5 Mt of 2.44 g/t gold and 17.5 g/t silver for 355,000 ounces of gold and 2.5M ounces of silver. In addition to the Yellowjacket deposit the District has a large low-grade oxide resource contained in five at surface deposits (Sierra Blanca, Air Track West, Jolly Jane, Mayflower and Connection) containing an estimated Oxidized Indicated Resource of 36.7 Mt at an average grade of 0.26 g/t gold for 307,860 ounces of gold and an Oxidized Inferred Resource of 242 Mt at 0.18 g/t gold for 1,366,000 ounces of gold (both at a 0.1 g/t gold cutoff), with appreciable silver credits. Unoxidized Inferred mineral resources are 213 Mt at 0.16 g/t for 1,117,000 ounces of gold (at a 0.1 g/t gold cutoff). Corvus Gold Inc. is a North American gold exploration and development company, focused on its near-term gold-silver mining project at North Bullfrog, Nevada. In addition the Company controls a number of other North American exploration properties representing a spectrum of gold, silver and copper projects. Corvus is committed to building shareholder value through new discoveries and the expansion of those discoveries in a recovering gold and silver market. This press release contains forward-looking statements and forward-looking information (collectively, “forward-looking statements”) within the meaning of applicable Canadian and US securities legislation. All statements, other than statements of historical fact, included herein including, without limitation, statements regarding the anticipated content, commencement and cost of exploration programs, anticipated exploration program results, the discovery and delineation of mineral deposits/resources/reserves, the potential to extend the depth of the Yellowjacket deposit into what appears to be a higher grade portion of the system; the potential for there to be high-grade veins outboard of the main Yellowjacket vein system, the potential to develop multiple Yellowjacket style high-grade zones and to expand the Yellowjacket deposit at depth, the potential for the Company to be able to establish the continuity of the deposit, the potential to discover additional high grade veins or additional deposits, including the potential for a large target to exist beneath the currently defined oxide deposit, the potential for the Yellowjacket system, in general, to get larger, with higher grades, at depth, the potential for the North Bullfrog system to continue to grow and/or to develop into a major new higher-grade, District scale, Nevada gold discovery, the potential for any mining at or production from North Bullfrog, the potential for the identification of multiple deposits at North Bullfrog, the potential for the Company to secure or receive any royalties in the future, business and financing plans and business trends, are forward-looking statements. Although the Company believes that such statements are reasonable, it can give no assurance that such expectations will prove to be correct. Forward-looking statements are typically identified by words such as: believe, expect, anticipate, intend, estimate, postulate, potential and similar expressions, or are those, which, by their nature, refer to future events. The Company cautions investors that any forward-looking statements by the Company are not guarantees of future results or performance, and that actual results may differ materially from those in forward looking statements as a result of various factors, including, but not limited to, variations in the nature, quality and quantity of any mineral deposits that may be located, variations in the market price of any mineral products the Company may produce or plan to produce, the Company's inability to obtain any necessary permits, consents or authorizations required for its activities, the Company's inability to produce minerals from its properties successfully or profitably, to continue its projected growth, to raise the necessary capital or to be fully able to implement its business strategies, and other risks and uncertainties disclosed in the Company’s 2013 Annual Information Form and latest interim Management Discussion and Analysis filed with certain securities commissions in Canada. All of the Company’s Canadian public disclosure filings may be accessed via www.sedar.com and readers are urged to review these materials, including the technical reports filed with respect to the Company’s mineral properties.